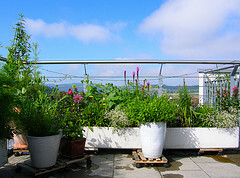 Balcony gardens, patio, or "small" gardens are very prevalent these days as more and more people move into apartments and condos. We all enjoy growing vegetables, flowering plants, herbs, etc., but we are not necessarily feeding a large family. Also, our budgets play a role in the size of our gardens. Well planned gardens will pay off in the long run. You will want to make the most of the space that you have. 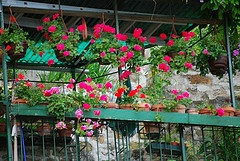 Light weight pots and hanging baskets are good choices for planting in. A trellis or two is a good option because vetical growing will maximize your harvest and serve as wind break. When growing vegetables in a small area you may want to consider using small varieties, for example mini squash, small cucumbers, and cherry tomatoes. 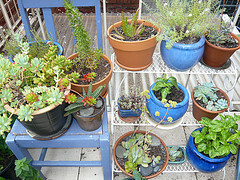 Be sure to pick up some drainage trays for you to set your plants in. 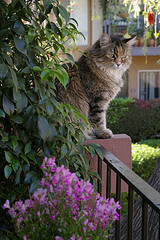 They will help you save on water and keep your area from being a mess for you and your neighbors below. When you are through planting and have everything cleaned up, you are ready to add your "garden art". Add a couple of pretty chairs, a small table, maybe even a fountain, a small statue or gazing ball. Anything that makes you smile. Now you are ready to sit back and enjoy your beautiful "mini" garden. 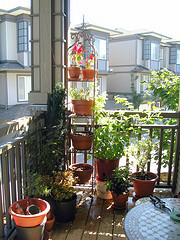 Balcony gardens , patio, or small gardens are really worth your time and effort. They not only add beauty and nurishment, but they also bring nature into your environment. This is a nice change from the asphalt jungle. All you need to do is check out our friends over at www.Burpee.com. They have everything you need to get started.